The author would like to thank Fedor Yurchikhin, the cosmonaut of RKK Energia, for providing his personal photos of the service module during its pre-launch processing in Baikonur. When in 1993, Russia was invited to join what would become the International Space Station, it brought along an array of hardware, drastically reshaping previously envisioned look of the outpost. The most significant Russian contribution in the space station design would be the service module, intended to provide life-support and living quarters for a three-member long-duration crew. The 20-ton module would also maintain the outpost's orbit with its propulsion system; supply and distribute electrical power from its solar panels; send, receive and process flight control information with its internal computers. Originally intended as a cornerstone of the Russian Mir-2 space station, the service module closely resembled the core module of the Mir space station and its design lineage traced back to the Salyut and Almaz space station programs. With the integration into the ISS design, the service module "lost" two of its lateral docking ports on its front spherical compartment. RKK Energia, the chief developer of the service module, originally proposed the craft as the first element of the ISS to be launched, however political considerations prompted NASA to accept the proposal from Moscow-based Khrunichev enterprise calling for a Russian-built and US funded module based on the TKS space tug, another descendant from the Almaz program, to be launched first. According to the new plan, the service module would be the third station component to reach orbit. It would then dock under remote control with the already orbiting control module and the US-built connecting module at an altitude of about 200 statute miles. The service module would have a wingspan of 97.5 feet from tip to tip of the solar arrays, and it would be 43 feet long from end to end. The Service Module contains three pressurized compartments: a small, spherical Transfer Compartment, PKhO, at the forward end; the long, cylindrical main Work Compartment; and the small, cylindrical Transfer Chamber at the aft end. An unpressurized Assembly Compartment is wrapped around the exterior of the Transfer Chamber at the aft of the module. 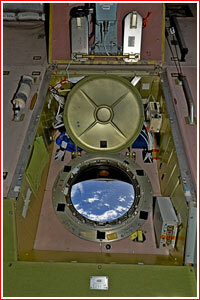 Aft section of the Zvezda Service Module as seen from an approaching transport vehicle. The Assembly Compartment holds external equipment such as propellant tanks, thrusters and communications antennas. The integrated propulsion system, ODU, of the service module consisted of two orbit-correction engines, KD, designated S5.79 with a thrust of 300 kilograms each and 32 small thrusters, DMT, designated 11D428A-10 and 11D428-14 and developed at NIIMash with a thrust of 12.5 kilograms each and designed to control course, yaw and bank movements of the module. All these engines would be fed from a four tanks with two tanks for oxidizer and two for fuel. Nitrogen gas was used for the pressurization of the tanks. The Service Module included four docking ports, one in the aft Transfer Chamber and three in the spherical forward Transfer Compartment -- one facing forward, one facing up and one facing down. The aft docking port has a probe and cone docking mechanism to allow docking with the Progress cargo ship and the Soyuz transport spacecraft. It also will be outfitted with an automated rendezvous and docking system. The forward docking ports all will have a hybrid docking mechanism to allow docking with the FGB using the forward-facing port; with a Russian Science Power Platform originally to be delivered in January 2001 using the "zenith" or up-facing port; and with a Russian Universal Docking Module originally scheduled to be delivered in April 2001 using the "nadir" or down-facing port. 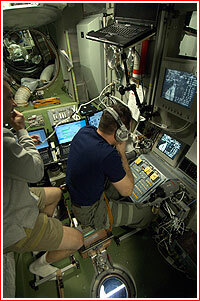 Living accommodations on the Service Module include personal sleeping quarters for the crew; a toilet and hygiene facilities; a galley with a refrigerator-freezer; and a table for securing meals while eating. The module will have a total of 14 windows, including three 9-inch diameter windows in the forward Transfer Compartment for viewing docking activities; one large 16-inch diameter window in the Working Compartment; an individual window in each crew compartment; and additional windows positioned for Earth and inside observations. Exercise equipment will include a NASA-provided treadmill and a stationary bicycle. The crews wastewater and condensation water will be recycled for use in oxygen-generating devices on the module, but it is not planned to be recycled for use as drinking water. Spacewalks using Russian Orlan-M spacesuits can be performed from the Service Module by using the Transfer Compartment as an airlock. The module also will provide data, voice and television communications with Mission Control Centers in Moscow and in Houston. The Zvezda Service Module and the ATV cargo ship on the background as seen by a spacewalking cosmonaut. 1993 Fall: The agreement between Russia and the United States on the construction of the "unified" space station called for the core module originally intended for the Mir-2 space station to be used as the service module in the cooperative project. 1996 Fall: Russia officially informed NASA that the service module would not be ready for launch in April 1998 due to lack of funding. 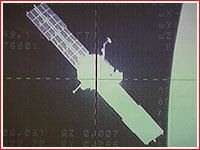 In response NASA initiated the development of the ICM (Interim Control Module) by the end of 1996. 1997 May: Due to the delays with the service module construction the partners in the ISS program officially delayed the launch of the station's first element -- the FGB control module -- from November 1997 to June 1998. 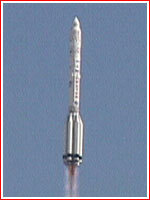 The launch of the service module is rescheduled from April to November 1998. 1998 October: The ISS partners agreed to conduct the launch of the first element in November 1998 despite continuous problems with the funding of the service module construction. At the time, the launch of the service module was scheduled in April 1999, but was expected to be delayed until June 1999. 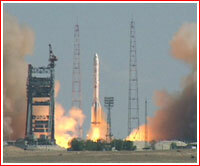 1998 Nov. 20: The Proton rocket successfully launches the FGB control module, dubbed Zarya ("Sunrise"). 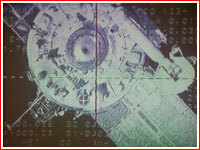 At the time the launch of the service module is expected no earlier than July 1999. 1999 April: NASA and Rosaviacosmos agreed to reschedule service module launch to the period between September 20 and November 20, 1999. 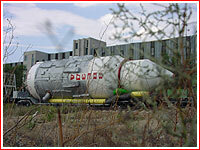 1999 May: The service module was shipped from RKK Energia test station to Baikonur. 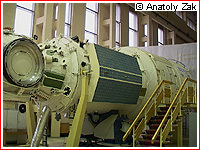 Since May 19, the module had been in processing building in Area 254 in Baikonur. 1999 Oct. 13: According to RKK Energia spokesman Sergei Gromov, it was agreed during negotiations with NASA that due to ongoing problems with the Space Shuttle fleet, the realistic date of the Zvezda launch would be February 2000. 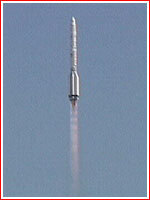 Previously announced launch date was at the end of December 1999 or beginning of January 2000. Russian officials still insist that Zvezda will be technically ready for launch in November of this year, however, Shuttle delays prompt them to delay Zvezda launch. Gromov said that the launch of the Progress cargo ship to the International Space Station originally planned for the end of November will be delayed as well. 1999 Oct. 27: The Proton rocket's second stage fails during the launch of the Express-A1 communications satellite. All Proton launches, including the mission to deliver the Zvezda service module, are grounded until the investigation determines the cause of the accident and some corrective measures could be implemented. 2000 Feb. 4: In the midst of the harshest criticism from NASA, caused by RKK Energia's decision to reactivate the Mir space station, Russian space officials said they were working to launch critical component of the the ISS in June, almost two months earlier than previously planned. Anatoly Kiselev, the director general of the Khrunichev enterprise, said that his company hopes to have the Proton rocket for the Zvezda service module ready for launch around June 20. Russian Aviation and Space Agency, Rosaviacosmos, confirmed the fact that plans have been made to launch Zvezda in June 2000. Vechaslav Mikhailechenko, Rosaviacosmos spokesman, said that the Zvezda launch date has been discussed on Feb. 1 in the telephone conversation between his agency director Yuri Koptev and NASA administrator Daniel Goldin. According to the transcript of the conversation, which Mikhailechenko reviewed, Goldin raised doubts in Russia's ability to provide the Progress cargo ships and Soyuz transport spacecraft for the ISS, while simultaneously supporting the Mir space station. 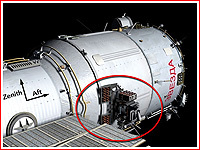 Officially, the Russian decision to move the Zvezda's launch date to June was dictated by unfavorable lighting conditions in July and August for the docking operations between the service module and the rest of the ISS. Russian ground controllers reportedly wanted the docking to take place in the daylight, when TV cameras could be used to assist in final maneuvers. The both spacecraft will be unmanned during the rendezvous. On Feb. 3, 2000, NASA Administrator Daniel Goldin, in the strongest words yet, accused Russia of "dragging its feet" in the ISS project and hinted that the country could face the expulsion from the program. Goldin put forward an ultimatum of sorts to Russia to launch Zvezda module by the end of August. NASA also made a decision to launch its own Interim Control Module, ICM, which could serve as a partial substitution to Zvezda. The ICM launch date will depend on the Russian ability to orbit Zvezda. Russian reaction to these developments has been cautious so far. Mikhailechenko said that despite its political undercurrent, the decision to launch ICM has a technical sense anyway, especially in the case if Zvezda is lost in the accident such as launch failure. In the past, Rosaviacosmos' director Yuri Koptev warned that Russian defiance to the pressure by the US to deorbit Mir could worsen already soured relationship between two space agencies. Ironically, NASA's efforts to scrap Mir combined with the noisy anti-Mir campaign in the US media and entertainment industry only fueled the determination of Russian lawmakers to allocate money specifically for Mir operations. "There is unhealthy attitude toward Mir in the US," the head of mission control in Korolev Victor Blagov said last week. NASA itself was long criticized mostly by the Republican members of Congress for allowing the Russian participation in the project. Ironically, NASA invited Russia in the ISS project initiated in 1984 only after almost decade-long delays, cost overruns and numerous budget cuts imposed by the Congress left space station project bankrupt by 1993. 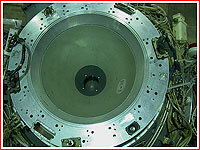 Russia, is now only two years behind schedule with the delivery of the service module. 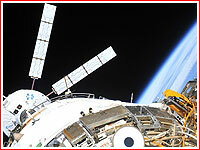 Goldin admitted on Feb. 3 that US components of the ISS are behind schedule as well. He said, that NASA can offer no advice to Russia in overcoming its rocket problems, since all of its major launch vehicles were plagued with failures in the past. Russia's effort to launch Zvezda in June depended entirely on the ability by a manufacturer to supply the engines for the second and third stage of the Proton rocket, which would carry the module aloft. The second-stage engines, manufactured by KB Khimmash in Voronezh, were blamed by the investigation commission in the two Proton failures last year. Although only the batch from 1992 and 1993 believed to have production flaws, which led to the failures, and all Proton rockets currently in processing have engines built no earlier then in 1998, Khrunichev decided to take no chances with the launcher for the Zvezda module. "We practically build the engines for this rocket from scratch," Kiselev said. The crucial elements of the engines, such gas generators and turbopumps will be upgraded to improve their reliability, better materials and improved design will be used, Kiselev said. A series of four of five test firings in KB Khimmash to validate the engine upgrades are still to be conducted before Zvezda can be launched. "We don't have those engines yet, however, we hope Voronezh (KB Khimmash) won't let us down, (in meeting June deadline)" Kiselev said. Kiselev said that beside the rocket for the Zvezda launch, the rest of the Proton fleet is on track to return to flight on Feb. 12 with the launch of the Garuda communications satellite. The experts used special probes to carefully inspect the engines in three fully-assembled Proton rockets currently in Baikonur and all other rockets sitting at Khrunichev's production plant in Moscow. "They all turned out to be clean," Kiselev said. At the end of the last month, KB Khimmash also conducted a test firing of the second stage engine intended to simulate the conditions of the Proton rocket crash last October. According to several sources in Moscow, the amount of contamination intentionally introduced into the engine during the test firing actually exceeded the level, which could conceivably be present in the engine as a result of the production rules violations and/or fueling problems. The contaminants were reportedly introduced into both propellant tanks and turbo pumps; yet, the preliminary data showed that the engine fired flawlessly. Some experts questioned the importance of the test, even before it was conducted, and the results of the firing will not likely to affect the decision to resume Proton operations, the experts said. 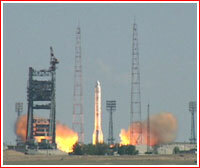 Khrunichev's director expressed confidence that Proton will be able to catch up soon with its delayed flight manifest. "We can fire three or even four Protons a month," Kiselev said. Julie Andrews, the spokeswoman for the International Launch Services, ILS, the joint venture between Khrunichev and Lockheed Martin echoed this opinion, saying that in several years of their cooperation, there was no serious schedule conflicts between Russian and Western payloads. 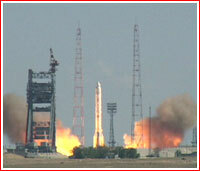 Currently, three launch pads for the Proton booster are operational in Baikonur. The launch pads 23 and 24 in the Area 81 are operated by the military personnel and launch pads 39 in Area 200 has been recently transferred to the Rosaviacosmos. The launch pad 40 in the Area 200 is under renovation. 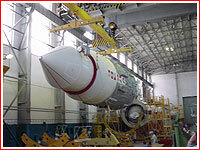 At the end of January 2000, KB Khimmash also conducted a test firing of the second stage engine intended to simulate the conditions of the Proton rocket crash last October. According to the sources in Moscow, the amount of contamination intentionally introduced into the engine during the test firing actually exceeded the level, which could theoretically be present in the engine as a result of the production rules violations and/or fueling problems. The contaminants were reportedly introduced into both propellant tanks and turbo pumps; yet, the preliminary data showed that the engine fired flawlessly. Some experts questioned the importance of the test, even before it was conducted, and the results of the firing will not likely to affect the decision to resume Proton operations, the experts said. The last month test intended to simulate the conditions of the Proton rocket crash last October did not produce the failure, which destroyed the ill-fated booster and thrown major international space projects into disarray. The bench engine firing conducted by the KB Khimmash in the city of Voronezh on Jan. 31, 2000 was imitating the kind of conditions the Russian investigation commission believed caused the Protons second stage engines to fail. According to the sources in Moscow, the amount of contamination intentionally introduced into the engine during the test firing actually exceeded the level, which could theoretically be present in the engine as a result of the production rules violations and/or fueling process. The contaminants were reportedly introduced into both propellant tanks and turbo pumps; yet, the preliminary data showed that the engine fired flawlessly. Some experts questioned the importance of the test, even before it was conducted, and the results of the firing will not likely to affect the decision to resume Proton operations on February 12 with the launch of the Garuda communications satellite. The Proton booster, the workhorse of the Russian space program, has been grounded, pending the investigation of the crash on Oct. 26, 1999, which resulted in the loss of the Express-A1 communications satellite. The accident also grounded a whole fleet of Russian and international payloads, as well as, the Zvezda module, the critical and long-delayed Russian contribution into the International Space Station, (ISS).After concluding that the most probable cause of the failure was the violation in production process at the engines manufacturing plant in Voronezh in 1993. 2000 Feb. 11: After a series of meetings in Russia, the participants in the International Space Station project (ISS) officially set up the launch date for the crucial Zvezda module on July 12, Russian Aviation and Space Agency announced. Russian, European and US space officials met in Moscow on Thursday, Feb. 10, to review the status of the $60 billion project and agreed that the Zvezda module, can be launched during the launch window between July 8 and 14. On Friday, Feb. 11, the new launch date was formally confirmed at the General Designer Council meeting at the RKK Energia offices in the town of Korolev, near Moscow. Around 350 top space officials were present, including 40-member team of experts from the US. General Designer Council is a Russian institution initiated at the dawn of the space age by Sergei Korolev, the founder of the Soviet space program. The council was traditionally responsible for the crucial decisions in the industry. According to Yuri Grigoriev, Deputy Designer General at RKK Energia, the Zvezda launch date is dictated by the latest predictions of the lighting conditions during the docking of Zvezda module with already flying elements of the ISS. The optimal conditions for the launch will be on July 12, Grigoriev said. If the July launch window is missed, the second opportunity will come in August. 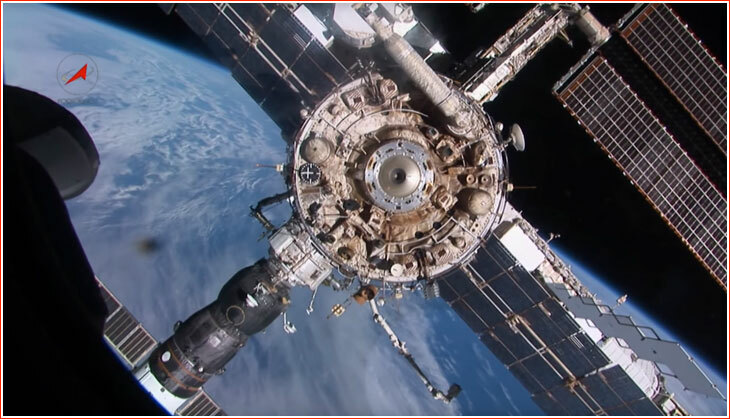 After 15 days of free flight, Zvezda and ISS should meet in orbit, with the Russian-built Zarya module of the ISS performing active maneuvers to complete the docking automatically. According to Kyle Herring, the spokesman at Johnson Space Center in Houston, NASA is now very confident that Russians will launch Zvezda in July. 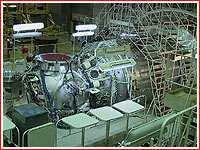 The Zvezda launch schedule will be contingent, however, on the success of the tests of the upgraded Proton engines, which have to be validated before Zvezda launch. "It has always been dependent on the Proton, the module itself is essentially ready," Herring said. 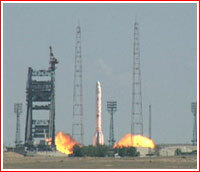 The Proton was grounded by the launch failure on October 27. The vehicle's return to flight is scheduled for February 12. According to sources in Moscow and Houston, NASA still plans the Shuttle mission to the ISS on April 13. The second Shuttle launch will take place after Zvezda is docked to the ISS. Originally only one so-called "outfitting" mission has been planned, however, delays in Zvezda launch and deterioration of several systems onboard Zarya prompted NASA to split the mission in two. During meetings in Moscow RKK Energia officials assured NASA that the company would be able to supply one Soyuz manned spacecraft and two Progress cargo ships for the ISS operations this year. NASA expressed concern that Russian decision to continue Mir operations, will impair RKK Energia's ability to supply the spacecraft for the ISS. The Soyuz spacecraft will have to be in a standby mode to launch an emergency crew to complete docking between the ISS and Zvezda manually, in case if automatic operations fail. If docking is successful, Soyuz will remain on the ground until October, when it will be used to deliver the first long-term expedition to the ISS. The Progress spacecraft can be launched to the ISS, soon after docking with Zvezda, to provide the extra fuel for the station. "We promised to have one Soyuz and one Progress spacecraft ready, by the time Zvezda is launched in July," Grigoriev said. NASA also requested the third Progress spacecraft for the ISS, for which RKK Energia currently does not have enough funds. Total, around a dozen spacecraft are currently in different stages of assembly at RKK Energia shops. However, the company struggled to obtain government funds to keep pace of production. 2000 April: This weekend Valeri Alaverdov, first deputy general director of Rosaviacosmos, who attending STS-101 launch attempt in April, said that Russia would meet the July 12 launch date. Tommy Holloway, the ISS program manager at Johnson Space Center echoed Alaverdov saying that he is confident Zvezda would take off between July 8 and 14. The modified engines for the Proton rocket, which will carry Zvezda arrived to Khrunichev plant in Moscow on April 1 and the fabrication of the rocket is expected to be completed around May 15. On May 28, Khrunichev expected to ship the rocket to Baikonur. Rosaviacosmos currently plans two launches of the modified Proton rocket to validate the upgraded second-stage engines for the Zvezda launch. Alaverdov said that the first Proton with modified engines would take off around May 18-19, carrying a Gorizont-45 communications satellite. Khrunichev enterprise was preparing to ship the Proton rocket for this launch on Wednesday, April 26. If this attempt is a success, another launch to validate Protons upgraded engines will take place in the second half of June. This time, the rocket will carry Geyser data relay satellite for the Russian Ministry of Defense. Although the Zvezda service module has been virtually flight-ready for the last several months, the Russian engineers tried to use the stand down to improve the spacecraft. The most important upgrade was related to the modules software. The new computer code for the Zvezdas flight control system will improve the survivability of the spacecraft should communication with the ground break down. According to the latest work plan the electrical testing on Zvezda currently conducted in Baikonur, will be completed on April 29. Following a May Day holiday celebrated in Russia, the module will go through a four-day test in the vacuum chamber. Around May 20, the international resident crews will visit Baikonur for a familiarization training with the their future orbital home. Zvezda will reach a critical milestone around June 16, when the final decision on the modules launch date will be taken. The decision will give go ahead to the so-called irreversible operations, such as fueling of the spacecraft with toxic and highly corrosive propellants. This critical operation currently scheduled for June 27. Around July 3, the fully assembled Zvezda and its protective shroud will be mated to the Proton launch vehicle and the whole system will be transported to the launch pad for the final processing. 2000 May 19: Next week, future inhabitants of the International Space Station, ISS, will have their last chance to peek inside the Zvezda service module, before it blasts off into space to provide them with room and board. Several US astronauts and Russian cosmonauts will leave Moscow for Baikonur on Monday, May 22, for an inside and out familiarization with the module, the procedure known as Crew Equipment Interface Test, CEIT. The Zvezda module is processed in Area 254 of Baikonur Cosmodrome in Kazakhstan and its long-delayed launch onboard Proton rocket is currently scheduled for July 12. This week, a number of tests on the module, including crucial checks in the vacuum chamber, have been completed. During two sessions planned between May 22 and 26, the astronauts and cosmonauts will familiarize themselves with both exterior and interior of the module. Following the training, the module will go through final integration and it should be mated with its launch vehicle on July 3. In the meantime, the manufacturers of the Proton rocket, which was holding back the Zvezda launch, say they up for the challenge of preparing the booster to carry the module in space on July 12. 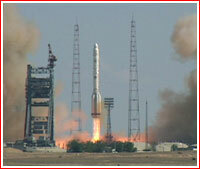 The Proton crash last October pushed the launch of Zvezda from the beginning of the year. Although the rocket returned to flight in February, Russian Aviation and Space Agency decided to use modified engines on the second and third stages of the rocket, which will carry Zvezda. Rosaviacosmos announced that two or three Protons with modified engines carrying less important payloads should fly successfully before Zvezda could take off. The first rocket with modified engines was shipped from Khrunichev's production plant in Moscow to Baikonur at the end of last month. It is currently expected to take off on June 5 carrying Gorizont-45 communications satellite. The second modified Proton that will take off prior to Zvezda launch has been assembled and it will leave for Baikonur Friday night, Yuri Gorodnichev, the chief-engineer of the Khrunichev production plant said. The rocket is now scheduled to take off on June 27, carrying Geyzer relay satellite for the Russian Ministry of Defense. The success of this launch will be considered as a green light for Zvezda. Last month, Russian officials said they hoped to launch the second Proton with modified engines around June 20. The Proton rocket Number 39801, intended for Zvezda currently going through final electrical tests at Khrunichev and it is scheduled to be shipped to Baikonur on May 28. "We will meet this deadline," Gorodnichev said. 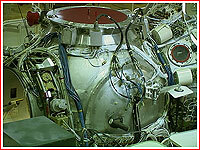 2000 June: Less than five weeks before the scheduled launch of the service module, Rosaviacosmos, was reportedly quarreling with the Russian Ministry of Defense over the payload that would ride on a Proton rocket in June 2000, preceding the launch of the Zvezda service module in July, according to some sources. The Ministry of Defense procured the Proton to launch a relay satellite, called Geyzer, this month. But more importantly, the launch is crucial for Rosaviacosmos, since it is designed to validate modified engines on the Proton's second and third stages -- engines that are needed to safely launch Zvezda. If the military and the space agency fail to mend their fences, the launch of Zvezda is in question. Now, a plan for a June 20 launch for the earlier Proton rocket has all but evaporated because the Geyzer satellite fell behind schedule and has pushed back the launch test of the engines. Rosaviacosmos, pressed by NASA and its other partners to move forward with the ISS construction schedule, proposed an alternate civilian payload -- an Express A-3 communications satellite -- for a ride on the modified Proton. That would preserve the June 20 launch date. But so far, the Ministry of Defense has said "nyet" to the plan. Representatives of the Russian Ministry of Defense who are responsible for the Geyzer launch could not be reached for comment. And Rosaviacosmos representatives would not comment on the status of the satellite, however, they said that an unprecedented four launches of the Proton rocket could take place this month, including one with a military payload. 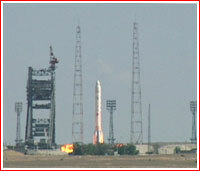 Counting the Geyzer launch, a total three Proton launches are currently crowded in the last 10 days of June 2000. Two Protons with standard engines were scheduled to take off at the end of the month: on June 22, a Proton with the Express A-3 satellite for the Russian Satellite Communications Company and, on June 30, a Proton with the Sirius 1 satellite for a US broadcasting company. Kyle Herring, a NASA Johnson Space Center spokesman, said that according to information provided by Rosaviacosmos, the second Proton launch with modified engines was still set for June 30. And NASA documentation still listed Geyzer as a payload for this launch. According to the latest plans, a review meeting to give the go-ahead for fueling and other "irreversible" pre-launch activities is set to take place between June 26 and 28, before the Phase 2 Proton takes off. 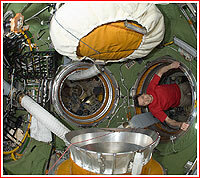 This change so far has had no effect on ultimate launch date for the Zvezda service module. "Russians are telling us [the Zvezda launch] will take place between [the] 10th and 12th of July," Herring said, "It was conveyed to us as recently as yesterday morning." Rosaviacosmos hoped to conduct a second and final validation launch with the new engines around June 20, before giving the go-ahead for fueling the Zvezda vehicle with highly toxic propellants and other procedures. 2000 July 3: The Zvezda service module, left its storage and testing area in preparation for the launch. 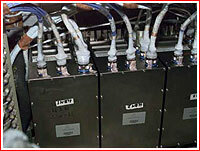 The module spent more then a year in the Area 254 processing building of the Baikonur Cosmodrome. On Monday morning, July 3, the personnel moved the Zvezda module enveloped into its protective shroud to the only active fueling station in Baikonur located in Area 31 in the Eastern section of the space center. The fueling is a crucial milestone in the almost decade-long preparation of this spacecraft for launch. Once the toxic propellants loaded into Zvezdas tanks its lengthy storage on the ground becomes extremely difficult and the operation is considered irreversible in the spacecrafts launch processing. The Russian space officials made a decision to wait with the fueling until the modified Proton rocket  the same type as the one to be used for the Zvezda launch  flies a successful test mission on July 5. 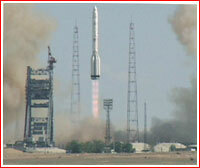 This would be the second launch to qualify upgraded engines on the Proton rocket. While under development for years, the modified engines were hastily prepared specifically for Zvezda launch. 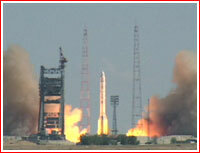 The first launch of the Proton rocket with modified engines has been conducted successfully on June 6. The officials currently hope to start fueling of Zvezda around 6 or 7 a.m. Moscow Time on July 5, if preliminary analysis of the launch just hours earlier proves that the Protons first three stages functioned flawlessly. Original schedule called for the fueling between July 3 and 4. However, the delay of the second Proton launch with modified engines pushed back fueling operations and narrowed Zvezdas launch window originally extended from July 8 to July 14. At least partially make up for the lost time, on Tuesday and Wednesday, the ground processing teams in Baikonur will connect fueling lines to Zvezdas tanks and make sure they are sealed. The engineers will also test the performance of the vacuum pumps, which will be used to remove the air from the fuel lines. The fueling itself planned to be executed under very tough deadlines to allow shipping Zvezda to the launch vehicle integration building on July 6. Another 30 hours allocated to mating Zvezda with its Proton rocket. On July 7, the Proton integrated with Zvezda is scheduled to roll out to the launch pad for final checkups before launch on July 12, 2000. 2000 July 5: The second Proton rocket with the modified engines on the second and third stage blasted off from Baikonur, carrying a Geyzer military relay satellite. Soon after the launch, the Russian media reported that the engines on the second stage of the booster showed anomaly, which could lead to the accident. 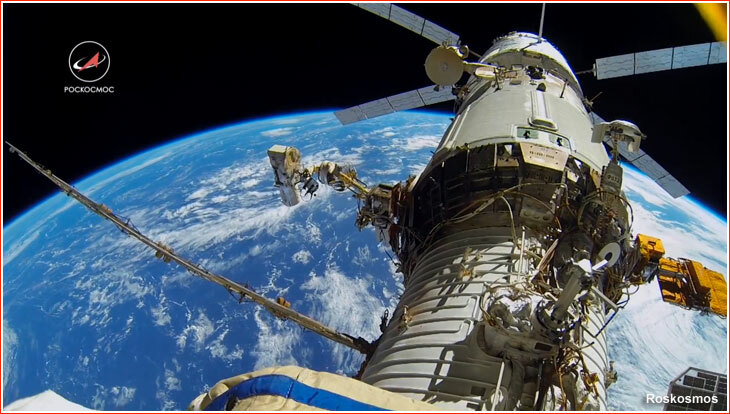 Nevertheless, after evaluating the situation, the Russian space officials decided to proceed with the on-time preparation for launch of the service module. 2000 July 8: The Proton rocket with the Zvezda service module, rolled out to the launch pad in Baikonur Cosmodrome on Saturday, July 8, for the final preparation for its launch next week. Traditionally for this Russian launch site in Kazakhstan, the more than 40-meter rocket with the Zvezda module under its nose fairing left the assembly building Number 92-1 in the early morning -- at 6:30 a.m. local time, when Sun just rose over burned steppe. Moving with the speed of a foot walker on its rail transporter, the rocket reached the launch pad Number 23 in Area 81 at 8:10 a.m. local time. Despite seemingly strict security at the gates to the launch complex, numerous observers greeted the rocket at the pad. Some of them were seen putting coins on rails to be smashed by the rocket train -- another old tradition of the cosmodrome. In the next few hours, special mechanisms were used to prop the rocket into the vertical position and lower it on the launch pad. The giant service tower then moved from the distance and completely enveloped the rocket into an array of access balconies. The launch personnel will use the tower to inspect the rocket and its payload in the next four days. Anatoly Kiselev, Director of Khrunichev enterprise, the manufacturer of the launcher, and Yuri Semenov Director of RKK Energia, responsible for the Zvezda service module, showed up at the launch pad soon after the rocket arrival with a large group of their associates. They told the crowd of reporters that everything is in perfect shape for July 12 launch. There are no issues, Kiselev said. We are one hundred percent ready, Semenov echoed him. The officials said that in the next day and a half, the RKK Energia team will conduct final inspection of the module now sitting on top of the rocket, and then it will be up to military personnel of Area 81 in Baikonur to prepare the Proton rocket for launch. They appear to know their business. The entrance into the launch complex reads completed in 1964. This is the first of four launch pads for the Proton rocket in Baikonur. The launch of the Zvezda service module will mark a major milestone for the multibillion-dollar project of the International Space Station, ISS. With the docking of the spacecraft with already flying elements of the ISS, the fledgling settlement in space will be able to accommodate three-man crew for long-duration expeditions. The Zvezda will also serve as a storage for propellants delivered by the Russian Cargo ships and will be able to fire its engines to adjust the stations orbit. 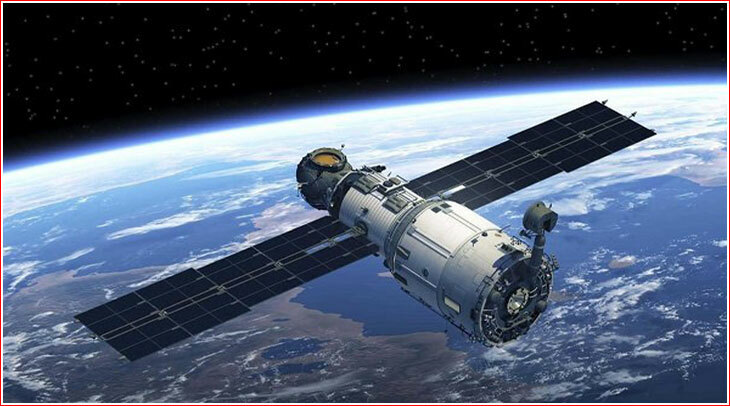 The construction of the module, the first element of the station financed entirely by the Russian government fell almost two years behind schedule. According to the latest information from Russian Aviation and Space Agency, Rosaviacosmos, the launch of the Zvezda service module is scheduled on July 12 at 10:56:28 a.m. local time. 2000 July 12: After a flawless countdown, the Russian Proton rocket carrying the Zvezda service module lifted off at 10:56:28 a.m. EDT (10:56:28 GMT) from Pad 23 at Site 81 in Baikonur Cosmodrome and 600 seconds later successfully delivered its payload into a 185-kilometer (114.9 miles) orbit. 2000 July 25, 03:44:44 Moscow Summer Time: The stack comprising the Zarya FGB module and the Unity Node successfully docked to the Zvezda service module.